Father’s Day is this weekend, and I like to think my kids enjoy having a material scientist for a father. They have a go-to resource for math questions, science projects are full of fun and significant digits, and when they visit the office they get to look at bugs and Velcro with the SEM. I’m always up to take them to museums to see crystals and airplanes and other interesting things as we travel around. That’s one way we have tried to make learning interactive and engaging. Another activity we have recently tried is 3D printing. 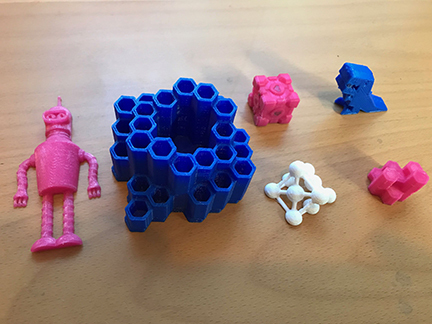 This has allowed us to find or create 3D digital models of things and then print them out at home. Here are some fun examples of our creations. At home we are printing with plastics, but in the Material Science world there is a lot of interest and development in printing with metals as well. This 3D printing, or additive manufacturing, is rapidly developing as a new manufacturing approach for both prototyping and production in a range of industries including aerospace and medical implants. Instead of melting plastics with a heated nozzle, metal powders are melted together with lasers or electron beams to create these 3D shapes that cannot be easily fabricated by traditional approaches. In these applications, it is important to have reliable and consistent properties and performance. 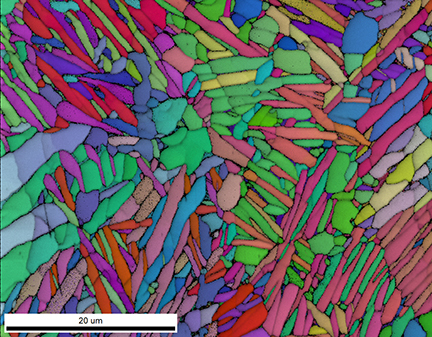 To achieve this, the microstructure of the metals must be both characterized and understood. 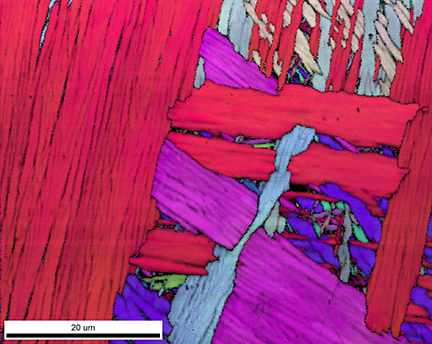 EBSD is an excellent tool for this requirement. The microstructures that develop during 3D printing are very interesting. Here is an example from a Ni-based superalloy created using Selective Laser Melting (SLM). This image shows a combined Image Quality and Orientation (IQ + IPF) Map, with the orientations displayed relative to the sample normal direction. 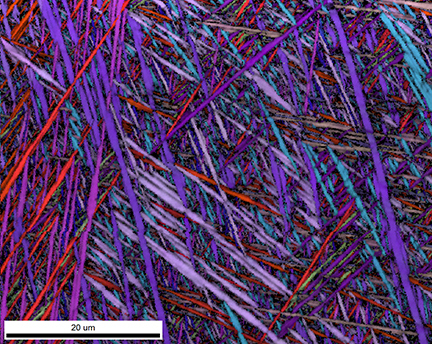 Rather than equiaxed grains with easily identifiable twin boundaries, as are common with many nickel superalloys, this image shows grains that are growing vertically in the structure. This helps indicate the direction of heat flow during the manufacturing process. Understanding the local conditions during melting and solidification helps determine the final grain structure. In some materials, this heating and cooling will cause not only melting, but also phase transformations that also affect the microstructure. Ti-6Al-4V (or Ti64) is one of the most common Titanium alloys used in both aerospace and biomedical applications, and there has been a lot of work done developing additive manufacturing methods for this alloy. Here is an IQ + IPF map from a Ti64 alloy built for a medical implant device. At high temperatures, this alloy transforms into a Body-Centered Cubic (or BCC) structure called the Beta phase. As the metal cools, it transforms into a Hexagonal Closed Pack (HCP) structure, called the Alpha phase. 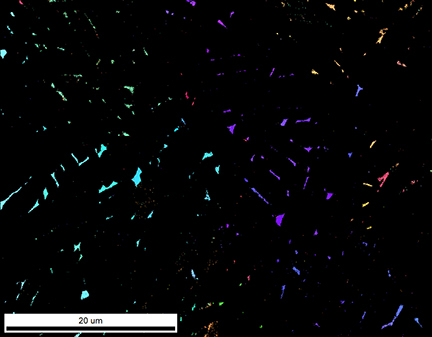 This HCP microstructure develops as packets of similarly oriented laths as seen above. However, not all the Beta phase transforms. 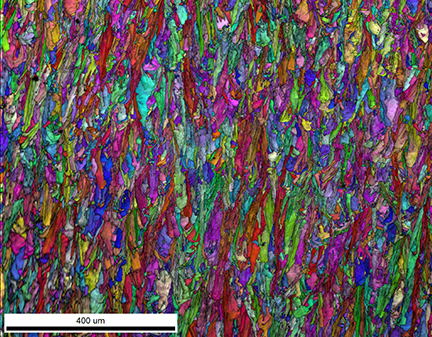 Here is an IQ + Phase EBSD map, where the Alpha phase is red and the Beta phase is blue. Small grains of the Beta phase are retained from the higher temperature structure. If we show the orientations of the Beta grains only, we see how the packets relate to the original Beta grains that were present at high temperatures. The rate of cooling will also influence the final microstructure. In this example, pieces of Ti64 were heated and held above the Beta transition temperature. One sample was then cooled in air, and another was quenched in water. 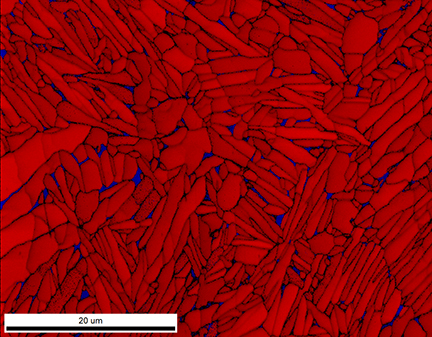 The resulting microstructures are shown below. The first is the air-cooled sample. The second is the water-cooled sample. Clearly there is a significant difference in the resulting structure based on the cooling rate alone. As I imagine the complex shapes built with additive manufacturing, understanding both the local heating and cooling conditions will be important for optimization of both the structure and the properties.